Ramp-metering signals will begin operating at the Mercer Street entrances onto I-5 this spring. After drivers endure gridlocked crossings on Seattle’s Mercer Street, they’ll see one more set of traffic lights to pass before finally getting the opportunity to merge into Interstate 5. Ramp-metering signals will be installed at the northbound and southbound freeway entrances, to operate weekends only starting March 10 — and then every day beginning April 10. The $250,000 project is meant to even the flow at which cars enter the crowded freeway, so merging becomes easier, and people driving on I-5 slam their brakes less often. Based on experience elsewhere, the Mercer signals are expected to decrease collisions by a third, and improve throughput by 3 to 5 percent, said Morgan Balogh, traffic engineer for the Washington State Department of Transportation (WSDOT). So if the freeway moves 7,000 cars per direction in the busiest hour, that might increase to 7,350 or so. Seven fatal crashes occurred from 2012-16 in the area, state data say. Ramp meters wouldn’t have prevented them all, but two occurred where traffic abruptly slows northbound near the Mercer onramp, a problem Balogh hopes to fix. In the northbound direction, both approach lanes will be metered, each with a signal alternating between red and green, so drivers take turns continuing to I-5. Those will operate in the mornings to improve merges — where traffic often clogs due to cars weaving right toward the Highway 520 floating-bridge exit. Northbound-ramp signals will be turned off in the afternoon, so drivers in the left approach lane continue at full speed into the I-5 express lanes, which point north in afternoon and evenings. Express lanes near Mercer have enough capacity that metering isn’t needed, Balogh said. In the southbound direction, a left shoulder will be converted to a third car holding lane, so there will be three lanes of storage altogether, while the first driver in each lane waits to go on green. Three alternating signals will spread the cars as they proceed into one I-5 onramp. This southbound onramp, to the left side of I-5, continues onto the freeway as a southbound high-occupancy lane a few seconds ahead, and that won’t change. Ramp-metering there raises a potential hazard. If a solo driver stops at I-5 to weave right in obedience to the law, and the cars behind have more room and speed approaching I-5, the risk of injury rear-end crashes might grow. “We’re confident that won’t happen,” Balogh says. He notes that no physical barriers prevent solo drivers from continuing into the HOV lane, until the thick traffic under the state Convention Center eases enough to present a safe opening. Other hazards might ease — like road rage and tailgating between Fairview Avenue North and I-5, where some drivers speed from the left and cut into car queues. WSDOT spokeswoman compared the scrum to reach I-5 to boorish guests at a wedding-reception buffet. Once there are three metered approach lanes, drivers will simply take turns going on green, rather than struggle for the single onramp lane, said spokeswoman Harmony Weinberg. “The experience should be a little less agitating,” she said. Overall, drivers will probably neither save nor lose time leaving South Lake Union, Balogh said. At the late-afternoon peak, drivers average up to 5 minutes just going from Fairview onto the freeway mainline southbound, he said. WSDOT and Seattle DOT are cooperating to ensure the ramp meters don’t worsen spillover congestion on Mercer Street and its tributaries, he said. The two departments didn’t produce an engineering study or agreement, he said. However, WSDOT’s other ramp meters, in busy places such as the University District or Lynnwood, are programmed to quicken the pace of green signals to drain off surface-street overloads, he said. Crews will install the signal equipment this month. The onramp southbound will close from midnight to 7 a.m. Saturday, followed by a northbound ramp closure from midnight to 7 a.m. two weeks later. WSDOT has considered Mercer-area ramp metering for five years, Balogh said. But the state chose to wait until after Seattle finished its megaproject to rebuild Mercer Street, and for traffic there to settle into a pattern. 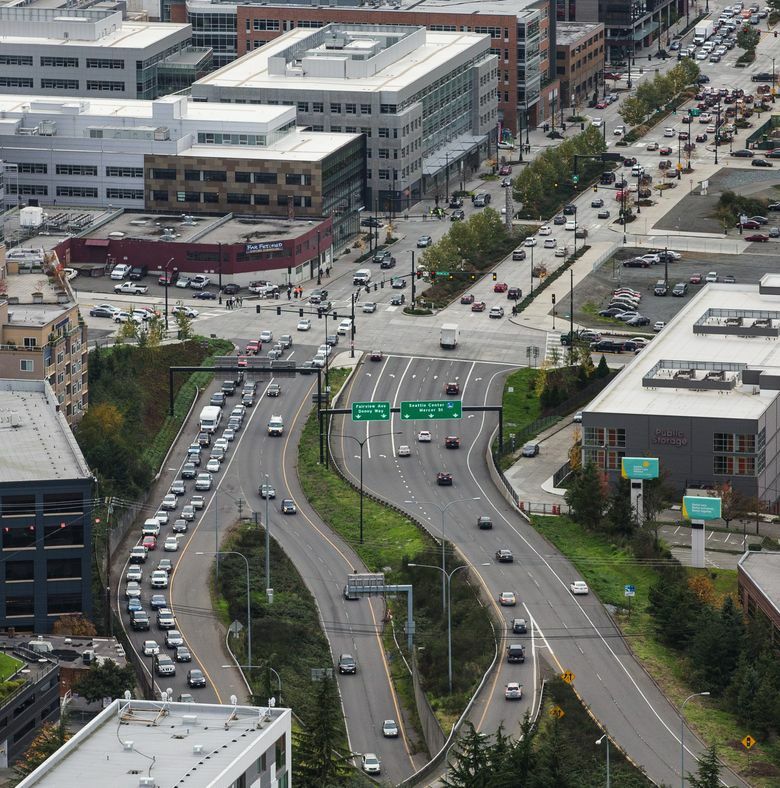 The fast-growing Mercer corridor, where I-5 ramps carry 80,000 vehicles per day, reaches the Amazon campus, UW Medicine, Allen Institute for Brain Science, Seattle Cancer Care Alliance, Bill & Melinda Gates Foundation, and KeyArena. Seattle rebuilt the bumpy, winding roads there into a straight, two-way boulevard with seven traffic lanes, wide sidewalks and an Aurora Avenue underpass from 2010-14 at a cost of $245.4 million. The city once claimed in a federal grant application that the Mercer rebuild would reduce I-5 congestion, but it has not. Seattle DOT has tried signal-retiming software to reduce delays on Mercer Street, and said in November it cut a 6 p.m. delay of 34 minutes down to 17 minutes. As commuter populations grow, side streets add additional delay. Pervasive gridlock in Mercer’s new intersections also forces people walking to circumnavigate cars in crosswalks.